A spider with a painful but not life-threatening bite has spread alarm through Austria in the past two weeks. 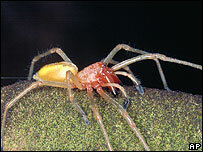 Bites from the yellow sack spider, which is up to 1.6cm (0.6in) long, were reported in several parts of Austria. The reports prompted 190 people to visit the main hospital in Linz - but only eight had possible symptoms. A doctor at Vienna's main hospital, Dieter Gruber, told the BBC it was a "wave of hysteria", saying hundreds of callers had asked about the spider. In an effort to ease public anxiety, Health Minister Maria Rauch-Kallat said "the bites of a yellow sack spider are indeed painful but not deadly". "If you are bitten, please don't panic and in case of discomfort immediately contact a doctor." Dr Gruber told the BBC News website that the spider's bite was "like a wasp's sting". In some cases it can trigger an allergic reaction. Austrian media have devoted much coverage to the spider - the Dornfingerspinne in German - with experts giving details about its behaviour and habitat. They say Europe has more venomous spiders to worry about, such as the Black Widow.